Soulsailor: For the love of Robbie? For the love of Robbie? So thats the first Solo open done for over 15 years! Unfortunately my dad bailed out and didn't sail.. just watched from the shore and critisised in proper "oppy-dad" styleee ahh them were the days! Suprisingly the Solo fleet are a bunch of cowboys... 1 start, general recall, second start black-flag and a general recall (Chris Brown and John Coleman DSQ'd), 3rd start all clear.. bloody finally... I though Ent sailors were bad but nope even at a relatively "noddy" 1-day open the Solo sailors push it! Grabbed lunch chatted with some old friends and my dad, took the piss out of Richard Pye because he wasn't gonna do the last race cus he was off to see Robbie Williams in concert :-) weirdo!! You don't risk being in the chocs just for a poncy ex-Take That singer...do you??? 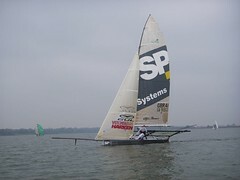 Yep the boyz were out training in the 18 foot skiff SP Systems...way cool. 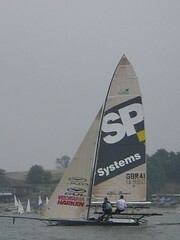 Such a shame there was so little wind, I think I saw 2 out of three high-trapezing at the most... great sight though! So race 2...good start, crap first beat..picked up well, lost some more, gained a few more and ended up 13th... not happy starting to think this was a bad idea, hey ho I shall persevere... it was interesting watching the finish... Pye had won the first and was leading from Chris Brown by a few boat lengths, the last beatr was short maybe 5 mins long, Rich tightly covered chris...and lost it (by a foot or so).... you should only cover tightly if you know you have better boat handling skills than the other guy, and to be fair in fleet racing I always prefer to loose cover and focus on me, my boat, my speed....oh well.. 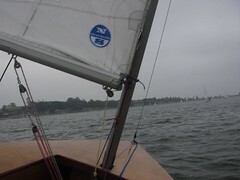 So, a good day in the end had a good sail and it made a change to be in a singlehander. Nice going dude. But be careful - single-handed sailing cane be seriously addictive.